Floor tiles exemplified wealth and standing in medieval society and, while lacking inherent religious or spiritual value, were central parts of the embellishment of Christian religious ceremonies. This spanish floor tile exemplifies how these functions evolved during a time of increasingly refined artistic taste, increasing wealth, and simmering religious tension. It was discovered at the site of All Hallows-Lombard Street, a medieval church located in the eastern section of the City of London. Found during the site’s excavation in 1940, this set was imported from Seville, Spain around 1500, is 142 mm in width, 143 mm in length, 26 mm in diameter, is made of ceramic and earthenware, and was made in the cuenca seca process. This process involves sinking individual design molds into the clay, leaving a narrow line around each part that allows different colored glazes to be used without running. This Islamic-inspired technique allowed for sharp ceramic designs foreign to England at the time. This set’s sharp borders between the floral and circular patterns as well as its use of beautiful gold, green, and light blues in close proximity demonstrate the style’s refinement and show it would have appealed to refined artistic pallets. This is further supported by its use among Spanish royalty in the court of Manuel I and the pavilion of Charles V in Seville’s Alcazar Gardens. Very few cuenca tiles have been found in England and even fewer in London, making the All Hallows discovery a very rare find. 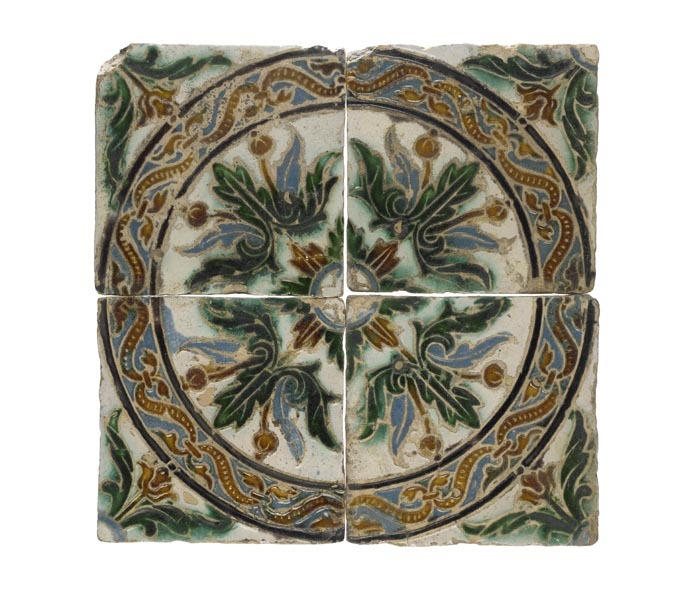 This tile arrived in London during a time of growing religious contention in the early sixteenth century. Regardless of whether it was procured by the Church or given by a wealthy donor, there is no record of how it came to All Hallows, it is very likely that it had taken on a new life to the community as an embodiment of the Church’s opulence and wealth. It is telling that it was recovered from the excavation of the site and not from the church’s floor pre-demolition; one could posit that during the Reformation it was likely either tucked away for safe keeping or taken out to make way for more modest designs. 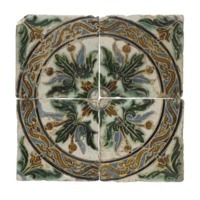 “Cuenca Seca Floor Tile,” Medieval London, accessed April 22, 2019, http://medievallondon.ace.fordham.edu/items/show/114.